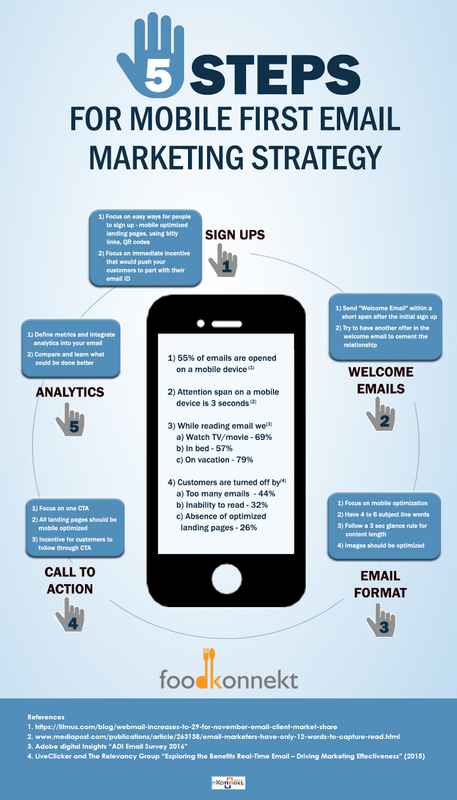 Now that we have established the having a “Mobile First” strategy is a must, let’s look at some of the email marketing strategies that you have to adopt in order to make this strategy a reality. Welcome Emails: Once they sign up make sure that you send a welcome email within a very short time span. This is very important as you want to remind your customers as to why they have signed and when they have signed – so your welcome email has to be personalized based on the sign up offer. Note that the welcome email has to be sent after the customer gets the offer as the welcome email would be a way to introduce your store, what they can expect and links to your social media etc. Email Format: With out a question your emails have to be mobile optimized – Design, Subject Line, content length, images & links. Subject Lines: With 6 – 10 subject line words, emails will have an open rate of 21% and increasing the number of words decreases the open rate (as per Inc.com research). Content Length: Stick to a 3 second rule where the customers are glancing through your content. The length should fit in one or two screen sizes and anything beyond that will make your customers scroll down. Images & Links: Your content should be a mix of images and text – the images should be optimized from a size and dimensions perspective. Your image size should be around 5-6 KB and there are multiple tools including Canva etc. The links should be clickable and make sure that the landing pages are mobile optimized. Include your social media links as you would like to get your customers follow you on your social media channels as well. Analytics: Now that you have designed emails and sent them, you want to check how they have fared. Some of the metrics you want to keep track of – which devices, open rates, click rates, location where the emails have been opened. Also integrate Google Analytics in order to view and analyze which strategies worked, what is the impact etc. In conclusion smartphones have revolutionized communication between customers and businesses. Now businesses have to adapt to this paradigm shift and focus more on “mobile-first” strategies in order to take advantage or be left out.